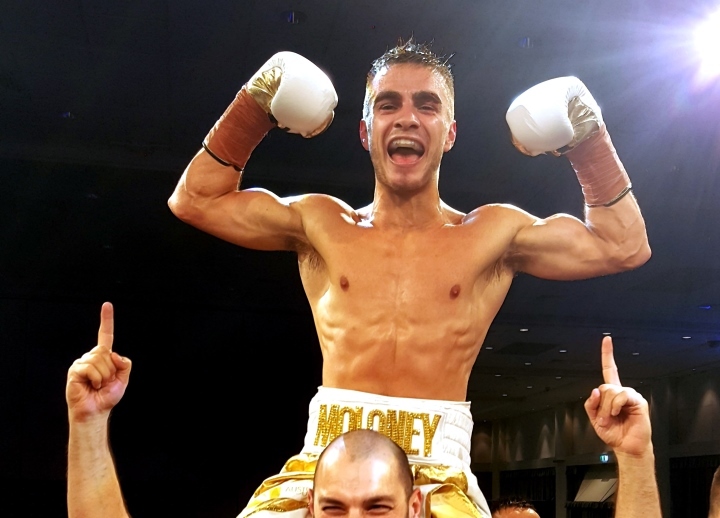 The mandatory eight-count he received for a knockdown from a punch that never launched was the very reminder needed for Andrew Moloney of the deck being stacked against him. The unbeaten super flyweight from Australia knew to expect some level of shadiness in facing Miguel Gonzalez in his native Chilé, but by that point in their title elimination bout truly realized he needed a clean knockout to win. Moloney served as the aggressor throughout the contest—and for good reason, as there was little to no chance of his winning a decision in his first career fight outside of Australia. His offense-heavy mindset proved a bit too ambitious when an exchange saw him miss with a punch and briefly stumble to the canvas midway through the contest. Referee Romina Arroyo initially appeared to correctly wave it off as a slip, but instead picked up the count from the official timekeeper’s table, leaving Moloney to shake his head in disbelief. It ultimately proved inconsequential, as he would power punch his way to victory, a left hook-heavy assault violently closing the show in round eight. Given the momentum swing, it appeared that the visiting contender could’ve surged to victory even with fight going more rounds. The judges certainly weren’t going to do him that favor, however; one card had the bout even at 66-66, while Moloney trailed 67-65 and a horrifically wide 68-64 at the time of the stoppage. Still, it was good practice for what to expect once he lands his first career title fight. He is now the mandatory challenger to unbeaten titlist Khalid “Kal” Yafai, who defends his title versus Norbelto Jimenez on June 1 at Madison Square Garden in New York City. The event also marks the U.S. debut of unbeaten, unified heavyweight titlist Anthony Joshua, who—like Yafai—is promoted by Eddie Hearn’s Matchroom Boxing. “Assuming Yafai wins in June, the reality for us is that we will likely fighting on their terms,” admits Moloney, whose twin brother Jason suffered his lone loss on the road in a 12-round decision to bantamweight titlist Emmanuel Rodriguez last October in Orlando, Florida. “He’s the bigger name and Matchroom Boxing is doing big things in England and the U.S. A fight like this was good practice for what to expect when everyone and everything is against you.